Rocky and Bullwinkle "Wossamotta U" Part 1 of 12, Aesop and Son "The Fox and the Hound", Peabody's Improbable History "Lord Francis Douglas", Rocky and Bullwinkle "Wossamotta U" Part 2 of 12. Rocky and Bullwinkle "Lazy Jay Ranch" Part 15, Fractured Fairy Tales "The Enchanted Gnat", Peabody's Improbable History "John Sutter", Rocky and Bullwinkle "Lazy Jay Ranch" Part 16. Rocky and Bullwinkle "Lazy Jay Ranch" Part 3, Fractured Fairly Tales "The Witch's Broom", Peabody's Improbable History "Johannes Gutenberg", Rocky and Bullwinkle "Lazy Jay Ranch" Part 4. Bullwinkle: [Last lines in last episode of series] Well, the old place is back to sub-normal, Rock? Rocky: Hey, was that a shot? Rocky: Well, it sounded like a shot. Rocky: Then, what was it? Bullwinkle: That was, "The End." The Fractured Fairy Tales are right near the top of my favorite Jay Ward cartoons. These unorthodox fairy tales are truly the "jewel in the crown" of The Bullwinkle Show. 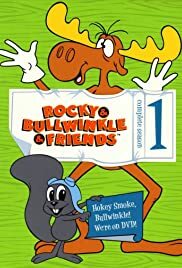 I don't think that I would have ever developed the love that I did, for Rocky, Bullwinkle (and their entourage of friends)had the Fractured Fairy Tales been excluded. Usually when I tuned into Rocky and Bullwinkle----even if the main part of the show was pretty good-----the show never really did begin until Edward Everett Horton began narrating those twisted Grimm Brothers tales! For me, Rocky and Bullwinkle were like the "warm-up band" on their own show----with their "supporting characters", on this side-show, as the main reason why I went to the "concert"! During one of Rocky and Bullwinkle's five seasons, Ward and Scott gave up on the Fractured Fairy Tales and produced Aesop and Son episodes instead. Though the format of Aesop's fables was similar to the Fractured Fairy Tales, I was always so disappointed whenever I saw the opening scene with the chisel in Aesop's hand, rather than the fairy with the huge story book. I would always wait "with bated breath" hoping for a fractured fairy tale; not an Aesop's fable. The Fractured Fairy Tales appealed to me because many of their stories took place in a world long lost to us (as long ago as Medieval times). The Fractured Fairy Tales were probably the most artistic and creative part of Jay Ward's endeavors. I loved that so many of the stories were full of castles, drawbridges, knights, kings and horses---so many beautiful horses with flowing manes. I loved the woodland and meadow scenes---- I loved the densely wooded forests; many of which were ENCHANTED, MAGICAL forests. I loved the open meadows with thick green grass and many colorful, pretty flowers (and sometimes there would be a river or lake closeby). I also loved some of the forests when they were made to look more ominous, by casting them in a darker light (both the trees themselves, and the eerie, gloomy sky around them). The animators also once took great pains to sketch a gingerbread house, in one episode, for Hansel and Grettel----complete with candy shingles. This gingerbread house was ensconced deep in the forest, all by itself). I also liked the occasional appearance of an old-fashioned spinning wheel. When I was a boy, we had a spinning wheel in the attic of our first house. This was an heirloom dating back to at least the 19th Century. It was passed down from some of my German ancestors. Because Mom never used the spinning wheel, or ever took it out of the attic, that heirloom held a kind of "mystique" for me. So it was neat to see it in a Jay Ward cartoon. I loved the "antique", even "gaudy", surrealistic colors that the animators sometimes used to paint the buildings and castles of small villages in a given tale. This would sometimes set the town and the buildings apart from the characters in the story. I loved the stories with witches, dwarfs, queens and frogs. One of my favorite Fractured Fairy Tales, of all time, starts out: "Once upon a time there was a year that was a very bad year for witches...They were everywhere: big ones, little ones, ugly ones....". The beginning of that tale even showed the year 1960 (when the cartoon was made), and flashed back to circa 1100 A.D. (that was a neat way of evoking a very special mood----along with the gloomy backdrop of the opening scenes). Another unique thing about the Fractured Fairy Tales: unlike most of Jay Ward's cartoons there were no recurring characters. You might see the same fairy tale spoofed two or three times-----but it was always basically the same story line and the characters did not come back in "to be continued" plots. I loved this! I liked Jay Ward's "one-time Grimm Brothers characters" better than most of the rest of his animated heroes. 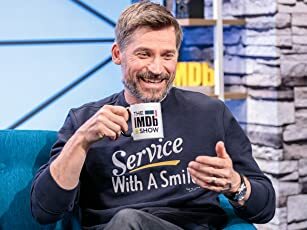 I guess you could say that it made them special, that you only got to spend five minutes with them, and that was it. These reproductions of Grimms' Fairy Tales would have been nothing, however, without the great voices used in these stories. As much as I have extolled the virtues of their animation, anyone who views them today will admit that much of the animation was somewhat primitive. There were so many character voices in these stories that I loved (provided by some of the best voice-over artists of the 50s and the 60s). Finally I will say, though some of these "bastardized versions" of the Grimm tales were not very good, MOST of them were great entertainment (There were 91 fairy tales; you can't help but have at least one or two "lemons"). A few of them really surprised me, as being just as good as the original, IF NOT BETTER. If you could package all 91 Fractured Fairytales into 2-hour videos, you would need three videos to do it (they are roughly 5 minutes a piece; that's 455 minutes). I'll be the first in line to buy all three, if that day ever comes! The great thing about these 5-minute stories is that they sometimes pack in a LIFETIME before they are over! I so often walk away from these tales, feeling richly blessed (and as if I were departing with my own "crown jewel"! ).